Jesse T. Atkins was born in the town of Enfield, Tompkins Co., N.Y. Jan. 19, 1820. He was one in a family of six children of William and Rozina Atkins. His father by a previous marriage had fifteen children, and hence was the father of twenty-one children. He was a native of Cherry Valley. His parents removed from Enfield and settled in the town of Greenwood, among the earlier settlers; was a farmer during his residence here, where both he and his wife died. 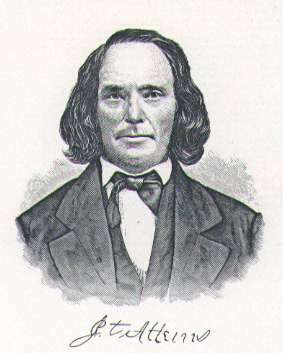 Jesse T. Atkins had very limited opportunities for an education, as in the early history of the town a pecuniary value was placed upon the time of children; he was reared on the farm and inured to the hardships common to a farmer’s life, in clearing off the forest and preparing the land for cultivation. After reaching his majority he purchased one hundred and ninety-five acres of land in the west part of the town of Greenwood, --on which his widow and famiy now reside, --a considerable part of which he cleared and made improvements upon of good farm buildings. July 19, 1854 he married Harriet, daughter of John and Roby Scott, of Greenwood. Her parents formerly resided in Genoa, Cayuga Co., N.Y., and settled in Greenwood about 1841; her father died two years prior to the settlement of the family here; her mother died February, 1876. Mrs. Atkins was born Dec. 21, 1836. Mr. Atkins spent his life as a farmer. He was a man of indomitable perseverance, resolution, and industry. He carried forward to successful completion whatever he undertook. For many years prior to his decease he dealt quite largely in stock, shipping to New York. He was known as an enterprising, thrifty business man, and possessed strict integrity in all his business operations. Mr. Atkins never gave much attention to politics, but was a member of the Republican party, and valued the right of suffrage. Of him it may be truthfully said no more stirring, active, and enterprising man lived in the town of Greenwood, and his farm and buildings show that he was a thoroughgoing agriculturist. He died April 13, 1868. His wife, a lady of good executive ability, is successfully carrying on the farm and making improvements thereon. Their children are, William, Jesse, and Rhoda. *The above information was obtained from the History of Steuben County, New York, Clayton, (1879).